We have the best range and many models of Horizontal Flow Wrapping machine. Call our technical helpline 9414044777 for free advice and best deals. - Sealing Type: Centre seal (Top bottom and centre seal). - Film type: Heat sealable laminated film and LDPE. - Drive type: Servo driven/ mechanical driven. 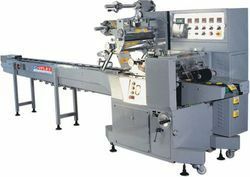 Suitable to pack geometrical shaped products like syringes, soap cakes, biscuits; our Flow Wrapping Machine is appreciated by the clients for its minimal maintenance and long life. 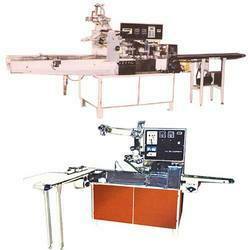 We are one of the most trusted Manufacturers, Suppliers and Exporters of the Flow Wrapping Machine from Ballabgarh. We are offering Flow Wrapping Machine to our clients. - Center sealing with side gusseting. - Side sealing & three side pouch making M / C for laminated films & BOPP films etc.